Impressive Sunderland brushed aside woeful West Ham with an emphatic win to ease relegation fears on Wearside. Sebastian Larsson's 25-yard thunderbolt lit up a dour first half, before Adam Johnson pounced after a Dan Potts error to double the lead from close range. Jack Colback hit the woodwork as West Ham began to crumble, before James McClean finished from a tight angle. The visitors failed to threaten until the end, when Ricardo Vaz Te and James Tomkins were denied by Simon Mignolet. The 3-0 scoreline was no less than Sunderland deserved for taking full advantage of an abject display by the visitors. Larsson's sublime opener was the only real moment of quality in the first half, but after the break the Black Cats tormented their opponents with some slick counter-attacking football. Sunderland now sit one point behind the Hammers as both sides' seasons take on a distinctly mid-table feel. On this evidence, Sam Allardyce's side should be the more concerned about the possibility of being dragged into a relegation battle, but they could do nothing about Larsson's spectacular 12th-minute strike. When Alou Diarra's headed clearance fell to the Swede, he took two touches before slamming a swerving left-footed drive past the helpless Jussi Jaaskelainen for his first goal of the season. West Ham have scored only five goals on their travels this season - the lowest of any Premier League side. Sunderland were content to keep 10 men behind the ball after taking the lead, and West Ham lacked the guile to break them down, with the absence of injured midfielder Mark Noble keenly felt. West Ham then contributed to their own downfall for the crucial second goal: a Premier League debut moment to forget for their 18-year-old defender Dan Potts. After Jaaskelainen did superbly to save McClean's strike, Potts dallied on the rebound and the ball fell for Johnson to finish clinically from five yards. The visitors were then lucky to not concede again when Colback smashed an effort against the woodwork following some sloppy defending. Allardyce's side failed to muster even a corner until the 62nd minute, and they fell further behind to a strike with a touch of comedy about it. The impressive Stephane Sessegnon raced into the box but completely miscued his shot, which fell fortuitously into the path of McClean to tuck away from an acute angle. West Ham introduced loan signing Marouane Chamakh and finally began to create chances in the closing stages. Vaz Te and Tomkins forced fine stops from Mignolet, but the Hammers could not add to their paltry tally of five away goals for the season - the lowest in the Premier League. Sunderland manager Martin O'Neill: "The win was important for us. I think anybody in the bottom half of the table still has to be looking anxiously over their shoulder. "We were brilliant from start to finish. We were energised after having a couple days off after the Bolton game. 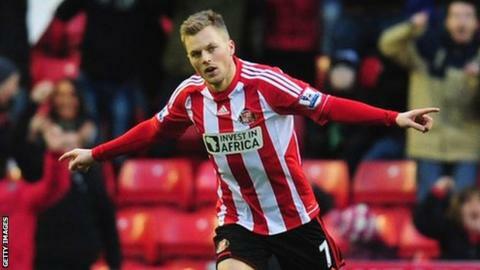 "We put West Ham on the back foot from the beginning, and a great goal from Seb (Larsson) settled us down." "I think it's our fourth win in seven games in the Premier League and in the context of things, it was good to win." West Ham manager Sam Allardyce: "We didn't have the appetite for defending correctly and we never passed the ball as well as we know we can. "(The second goal) was pathetic, wasn't it? We have a free-kick and we let the opposition score. "The level of difference in performance between this game and last week against Manchester United is just staggering. "There are too many of my defenders injured; George McCartney, Joey O'Brien and today James Collins. I am really going to have to go and try to strengthen that area in the next few days."